Wayne Pierce "MC's" the 2006 99 Car show Awards ceremony. STOCKTON - Wayne Pierce is looking forward to coming back to his auto racing home. The Stockton native went to races at Stockton 99 Speedway as a child and later became a driver and car owner before spending nine years as the track's announcer. He will be bringing his knowledge and baritone voice back to the track as the lead announcer for the 2011 season. "It's so good to be home," Pierce said. "That's what I've always called this track. And it should be a really fun year." 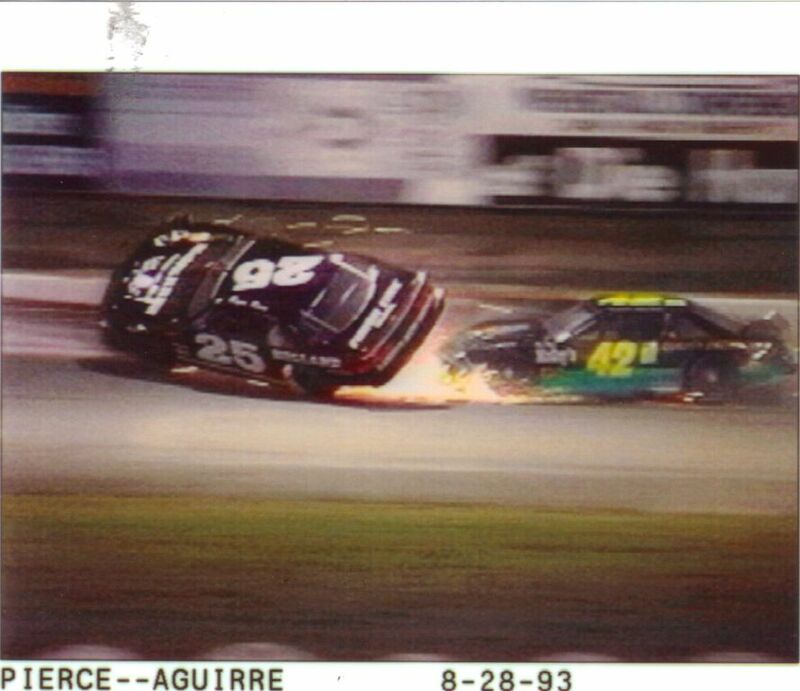 Wayne Pierce, #25 mixes it up with #42 Aguirre on 8-28-93!! was rained out in November. The NASCAR Whelan All-American Series opens April 9. Pierce, a 58-year-old retired Delta College bus operator and mechanic, isn't the only returning Stockton 99 veteran. Pat Patnaude, a former track general manager at Stockton and Madera Speedway, is joining the staff. "It's wonderful that people with their knowledge and experience want to come back," said Tony Noceti, who recently signed a new 10-year contract to run the facility. Pierce left Stockton when it closed after the 2006 season and went to Madera to take over the announcing duties. Stockton 99 reopened in 2009 and last year the Thunder needed announcing help late in the season, and Pierce made a few appearances before moving back permanently. "I enjoyed my time at Madera. I made a lot of good friends," Pierce said. "And I never thought Stockton 99 would open again. I never would have believed it." 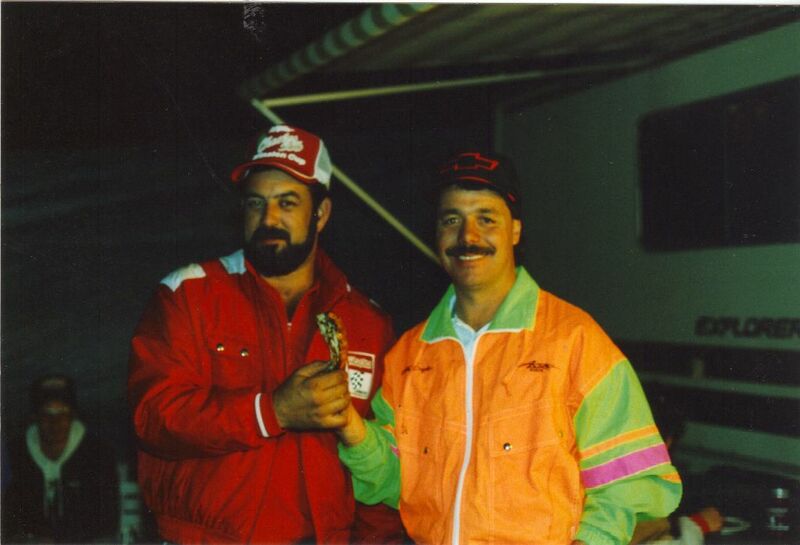 Wayne drove at 99 and was a B Main Champion. owned part of Stockton 99 and built Oakmoore Golf Course near the track. Pierce played as a youth at both spots and later spent a 10-year career as a driver before going into the announcing booth. One of his most memorable moments came in 2006 when he performed a marriage ceremony on the front straightaway of the track. He was certified as a deputy commissioner of civil marriages for San Joaquin County for the day and has since become an ordained minister and officiated many marriages and funerals in the local racing community. "To me, it is like one big family," said Pierce, who will be joined by his announcing partner Louis "Hot Lap Louie" Sartain. Wayne interviews Tony Noceti in 2005.
will act as a "roving troubleshooter." "It's certainly going to help us to have a man like Pat coming back," Noceti said. "He knows a lot about this business and will be able to help us in many areas." Noceti said the season schedule was streamlined this year with several breaks for both economic and family reasons. "I'm happy, and from the feedback I've been getting, the drivers are happy," Noceti said. "They can afford to run this kind of schedule, and a lot of them have families. It gives them a chance to race, and spend some time away from the track." Among the notable events are two appear-ances by the Supermodified Racing League's Southwest Tour Series (June 4, Aug. 20), the return of the United States Auto Club on July 9, and the traditional Independence Day racing and fireworks show on July 3.